One thing you can always say about the residents of Edinburgh is that we are always fiercely proud of our city. The architecture is second to none, and as caretakers of one of the world’s largest UNESCO World Heritage sites we love our buildings, our large green spaces, our world-class galleries and museums, our history and our arts festivals. There is something deeply special about showing a friend around the city for the first time. Watching them marvel at the total beauty of absolutely everything. Walking down Princes Street is not just about the shopping. It’s an experience, despite the mandatory castle questions (yes, that IS the castle. Actual Edinburgh Castle. Yes, it’s medieval. No, they did not build it for the festival). Then you’d hit the St James Centre at the east end of Princes Street. A 1970s monstrosity – let’s just skip past that. Pretend it’s not there. Scuttle through the dark corridors, low ceilings, fluorescent lighting. A necessary evil to get to John Lewis and the wide open space at the other side towards Leith Walk and Calton Hill. A bit of a blip on the Edinburgh landscape, it’s painful to know that they raised a Georgian square to build it. 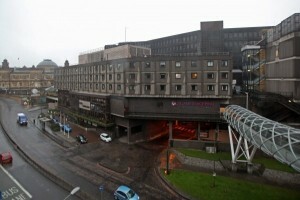 When the news broke that the St James Centre was due to be demolished, and a new ‘Edinburgh St James’ is planned, Edinburgh awaited the plans in hopeful anticipation. The new centre is going to be modern – with lots of glass, lots of light, lots of shops, lots of parking, lots of residential apartments, a five-star hotel and multi-screen cinema. Edinburgers have never been afraid of the modern world. Pioneers in science, technology, medicine and engineering, as part of the Scottish nation we fancy ourselves visionary forward-thinkers. When it comes to architecture – we’re terrified of change. Burned by the 1970s St James ‘development’, what if we’re just repeating history and leaving future generations with just a different eyesore on the Edinburgh landscape? Staunchly proud of our history and looking at the plans for the new Edinburgh St James… it’s hard not to be excited. 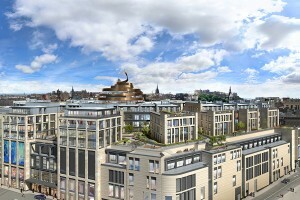 There have been a host of modern developments within the city centre that have enhanced Edinburgh. Surely Edinburgh St James can follow in the footsteps of Quartermile, Fountainpark and Greenside. It has the opportunity to be a statement Edinburgh’s state of mind – modern yet classic, elegant, bustling and open for business. We can’t wait to see it finished. With nervous yet hopeful anticipation.